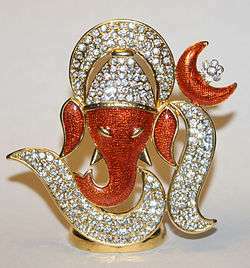 This article is about the sacred sound and spiritual icon in Indian religions. For movies and other uses, see Om (disambiguation). "Aum" redirects here. For other uses, see Aum (disambiguation). Om ( listen , IAST: Auṃ or Oṃ, Sanskrit: ॐ) is a sacred sound and a spiritual icon in Indian religions. It is also a mantra in Hinduism, Buddhism, Jainism, and Sikhism. 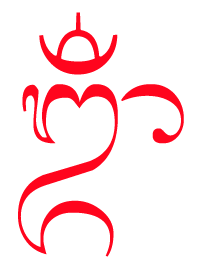 The syllable Om is referred to as praṇava. Other used terms are akṣara (literally, letter of the alphabet, imperishable, immutable) or ekākṣara (one letter of the alphabet), and omkāra (literally, beginning, female divine energy). Udgitha, a word found in Sama Veda and bhasya (commentaries) based on it, is also used as a name of the syllable. Phonologically, the syllable ओम् represents /aum/, which is regularly monophthongised to [õː] in Sanskrit phonology. When occurring within spoken Sanskrit, the syllable is subject to the normal rules of sandhi in Sanskrit grammar, however with the additional peculiarity that after preceding a or ā, the au of aum does not form vriddhi (au) but guna (o) per Pāṇini 6.1.95 (i.e. 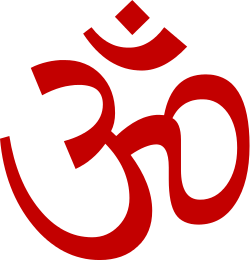 'om'). It is sometimes also written ओ३म् (o̿m [õːːm]), notably by Arya Samaj, where ३ (i.e., the digit "3") is pluta ("three times as long"), indicating a length of three morae (that is, the time it takes to say three syllables) — an overlong nasalised close-mid back rounded vowel. 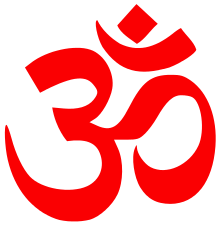 The Om symbol is a ligature in Devanagari, combining ओ (au) and chandrabindu (ँ, ṃ). In Unicode, the symbol is encoded at U+0950 ॐ DEVANAGARI OM and at U+1F549 🕉 OM SYMBOL ("generic symbol independent of Devanagari font"). The Om or Aum symbol is found on ancient coins, in regional scripts. In Sri Lanka, Anuradhapura era coins (dated from the 1st to 4th centuries) are embossed with Aum along with other symbols. Nagari or Devanagari representations are found epigraphically on medieval sculpture, such as the dancing Shiva (ca. 10th to 12th century); Joseph Campbell (1949) even argued that the dance posture itself can be taken to represent AUM as a symbol of the entirety of "consciousness, universe" and "the message that God is within a person and without". The Om symbol, with epigraphical variations, is also found in many southeast Asian countries. For example, it is called Unalom or Aum in Thailand and has been a part of various flags and official emblems such as in the Thong Chom Klao of King Rama IV (r. 1851–1868). The Cambodian official seal has similarly incorporated the Aum symbol. In traditional Chinese characters, it is written as 唵 (pinyin - ǎn), and as 嗡 (pinyin - wēng) in simplified Chinese characters. 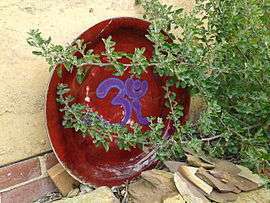 Om came to be used as a standard utterance at the beginning of mantras, chants or citations taken from the Vedas. For example, the Gayatri mantra, which consists of a verse from the Rigveda Samhita (RV 3.62.10), is prefixed not just by Om but by Om followed by the formula bhūr bhuvaḥ svaḥ. Such recitations continue to be in use in Hinduism, with many major incantations and ceremonial functions beginning and ending with Om. Maheshwarananda (2002) suggests that the Om reflects the cosmological beliefs in Hinduism, as the primordial sound associated with the creation of universe from nothing. Rik (ऋच्, Ṛc) is speech, states the text, and Sāman (सामन्) is breath; they are pairs, and because they have love and desire for each other, speech and breath find themselves together and mate to produce song. The highest song is Om, asserts section 1.1 of Chandogya Upanishad. It is the symbol of awe, of reverence, of threefold knowledge because Adhvaryu invokes it, the Hotr recites it, and Udgatr sings it. The second volume of the first chapter continues its discussion of syllable Om, explaining its use as a struggle between Devas (gods) and Asuras (demons). Max Muller states that this struggle between gods and demons is considered allegorical by ancient Indian scholars, as good and evil inclinations within man, respectively. The legend in section 1.2 of Chandogya Upanishad states that gods took the Udgitha (song of Om) unto themselves, thinking, "with this [song] we shall overcome the demons". The syllable Om is thus implied as that which inspires the good inclinations within each person. 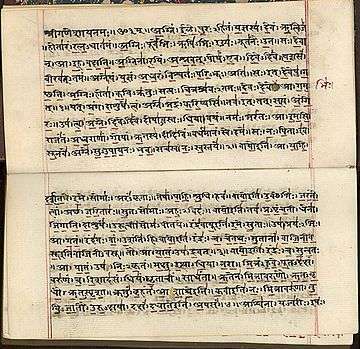 The Katha Upanishad is the legendary story of a little boy, Nachiketa – the son of sage Vajasravasa, who meets Yama – the Indian deity of death. Their conversation evolves to a discussion of the nature of man, knowledge, Atman (Soul, Self) and moksha (liberation). In section 1.2, Katha Upanishad characterizes Knowledge/Wisdom as the pursuit of good, and Ignorance/Delusion as the pursuit of pleasant, that the essence of Veda is make man liberated and free, look past what has happened and what has not happened, free from the past and the future, beyond good and evil, and one word for this essence is the word Om. The Maitrayaniya Upanishad in sixth Prapathakas (lesson) discusses the meaning and significance of Om. The text asserts that Om represents Brahman-Atman. The three roots of the syllable, states the Maitri Upanishad, are A + U + M. The sound is the body of Soul, and it repeatedly manifests in three: as gender-endowed body - feminine, masculine, neuter; as light-endowed body - Agni, Vayu and Aditya; as deity-endowed body - Brahma, Rudra and Vishnu; as mouth-endowed body - Garhapatya, Dakshinagni and Ahavaniya; as knowledge-endowed body - Rig, Saman and Yajur; as world-endowed body - Bhūr, Bhuvaḥ and Svaḥ; as time-endowed body - Past, Present and Future; as heat-endowed body - Breath, Fire and Sun; as growth-endowed body - Food, Water and Moon; as thought-endowed body - intellect, mind and pysche. Brahman exists in two forms - the material form, and the immaterial formless. The material form is changing, unreal. The immaterial formless isn't changing, real. The immortal formless is truth, the truth is the Brahman, the Brahman is the light, the light is the Sun which is the syllable Om as the Self. Aitareya Aranyaka in verse 23.6, explains Om as "an acknowledgment, melodic confirmation, something that gives momentum and energy to a hymn". Therefore, uttering Om, the acts of yajna (fire ritual), dāna (charity) and tapas (austerity) as enjoined in the scriptures, are always begun by those who study the Brahman. In Buddhism, Om is often placed at the beginning of mantras and dharanis. Probably the most well known mantra is "Om mani padme hum", the six syllable mantra of the Bodhisattva of compassion, Avalokiteśvara. This mantra is particularly associated with the four-armed Shadakshari form of Avalokiteśvara. Moreover, as a seed syllable (bija mantra), Aum is considered sacred and holy in Esoteric Buddhism. Scholars interpret the first word of the mantra "Om Mani Padmi Hum" to be AUM, with a meaning similar to Hinduism – the totality of sound, existence and consciousness. Aum is symbolically presented with Nio (仁王) statues in Japan, and their equivalent in East Asia. Nio are present as pairs, in front of Buddhist temple gates and stupas, in the form of two fierce looking guardian kings (Vajra). One has an open mouth, believed by Buddhists to be symbolically speaking "A"; the other has closed mouth, symbolically speaking "UM" (or, "Un" in local transliteration). The two together are traditionally believed to saying "AUM", the vajra-breath, or the Absolute in Sanskrit. Komainu (狛犬), also called lion-dogs, found in Japan, Korea and China, also occur in pair before Buddhist temples and public spaces. One has open mouth (Agyo), the other closed (Ungyo). Like Nio statues, they are traditionally interpreted to be saying the start and end of "Aun" – a transliteration of the Sanskrit sacred syllable Aum (or Om), signifying the start and end of everything. Ik Onkar, iconically represented as ੴ in the Sri Guru Granth Sahib (although sometimes spelt out in full as ਏਕੰਕਾਰੁ) is the statement of singularity in Sikhism, that is 'there is one God'. The phrase is a compound of the numeral one (ik) and onkar, states Doniger, canonically understood in Sikhism to refer to "absolute monotheistic unity of God". Ik Onkar has a prominent position at the head of the Mul Mantar and the opening words of the Sri Guru Granth Sahib. The Onkar of Sikhism is related to Om in Hinduism. Some Sikhs disagree that Ik Onkar is same as Om. Onkar is, states Wazir Singh, a "variation of Om (Aum) of the ancient Indian scriptures (with a slight change in its orthography), implying the seed-force that evolves as the universe". Ek Onkar is part of the "Mul Mantra" in Sikh teachings and represents "One God", explains Gulati, where "Ek" means One, and Onkar is "equivalent of the Hindu "Om" (Aum)". Guru Nanak wrote a poem entitled Oankar in which, states Doniger, he "attributed the origin and sense of speech to the Divinity, who is thus the Om-maker". ↑ Aitareya Brahmana 5.32, Rig Veda, pages 139-140 (Sanskrit); for English translation: See Arthur Berriedale Keith (1920). The Aitareya and Kauṣītaki Brāhmaṇas of the Rigveda. Harvard University Press. p. 256. ↑ Henry Parker, Ancient Ceylon (1909), p. 490. ↑ Joseph Campbell (1949), The Hero with a Thousand Faces, 108f. ↑ Ankita Roy (2011), Rediscovering the Brahmi Script. Industrial Design Center, IIT Bombay. See the section, "Ancient Symbols". ↑ Paramhans Swami Maheshwarananda, The hidden power in humans, Ibera Verlag (2002), p. 15. ↑ John A Grimes (1995). Ganapati: Song of the Self. State University of New York Press. pp. 77–78. ISBN 978-0791424391. 1 2 3 von Glasenapp 1999, pp. 410-411. ↑ oma ekākṣara pañca-parameṣṭhi-nāmā-dipam tatkathamiti cheta "arihatā asarīrā āyariyā taha uvajjhāyā muṇiyā"
1 2 3 Snodgrass, Adrian (2007). The Symbolism of the Stupa, Motilal Banarsidass. p. 303. ISBN 978-8120807815. 1 2 Baroni, Helen J. (2002). The Illustrated Encyclopedia of Zen Buddhism. Rosen Publishing. p. 240. ISBN 978-0823922406. ↑ ""OM" - THE SYMBOL OF THE ABSOLUTE". Retrieved 13 October 2015. ↑ Olsen, Carl (2014). The Different Paths of Buddhism: A Narrative-Historical Introduction. Rutgers University Press. p. 215. ISBN 978-0813537788. ↑ Getty, Alice (1988). The Gods of Northern Buddhism: Their History and Iconography. Dover Publications. pp. 29, 191–192. ISBN 978-0486255750. ↑ Ball, Katherine (2004). Animal Motifs in Asian Art. Dover Publishers. pp. 59–60. ISBN 978-0486433387. ↑ Arthur, Chris (2009). Irish Elegies. Palgrave Macmillan. p. 21. ISBN 978-0230615342. ↑ Singh, Khushwant (2002). "The Sikhs". In Kitagawa, Joseph Mitsuo. The religious traditions of Asia: religion, history, and culture. London: RoutledgeCurzon. p. 114. ISBN 0-7007-1762-5. 1 2 3 4 5 Doniger, Wendy (1999). Merriam-Webster's encyclopedia of world religions. Merriam-Webster. p. 500. ISBN 978-0-87779-044-0. Retrieved 2015-09-23. ↑ Mahinder Gulati (2008), Comparative Religious And Philosophies : Anthropomorphlsm And Divinity, Atlantic, ISBN 978-8126909025, pages 284-285; Quote: "While Ek literally means One, Onkar is the equivalent of the Hindu "Om" (Aum), the one syllable sound representing the holy trinity of Brahma, Vishnu and Shiva - the God in His entirety." ↑ SS Kohli (1993), The Sikh and Sikhism, Atlantic, ISBN 81-71563368, page 35, Quote: "Ik Aumkara is a significant name in Guru Granth Sahib and appears in the very beginning of Mul Mantra. It occurs as Aum in the Upanishads and in Gurbani, the Onam Akshara (the letter Aum) has been considered as the abstract of three worlds (p. 930). According to Brihadaranyaka Upanishad "Aum" connotes both the transcendent and immanent Brahman. ↑ Messerle, Ulrich. "Graphics of the Sacred Symbol OM".